Learning how to make muffins is extremely easy and fun. Far easier than cakes or cookies. There's no creaming butter or sugar, simply mix together in a bowl and you're done. Sweet, savory, large or small. Enjoy them hot or cold, served at breakfast, morning tea, afternoon tea or lunch. Muffins are often made from all-purpose flour then have a raising agent such as baking powder or baking soda added to make them rise. But the same rules for baking apply here. Accurate measuring is essential for success. Combine the dry ingredients in a bowl. If you are adding spices to the mix, sift the flour with the raising agent and any spices together to mix them evenly. The wet ingredients are always mixed separately in another bowl. Quick mixing is the secret to great muffins. As soon as the liquids are added, the raising agents will start to work. So the wet and dry ingredients are only mixed together when you are ready to bake. Once the mixture has been mixed it needs to be placed in the oven almost immediately. You can't leave muffin mixture sitting around for too long. Over mixing your dough will result in muffins that are tough. Use a spatula to fold the ingredients together. Stir only until the flour is no longer visible. This shouldn't take more than about 25 stirs. Remember the mixture won't be smooth. But this won't matter, it doesn't have to be. 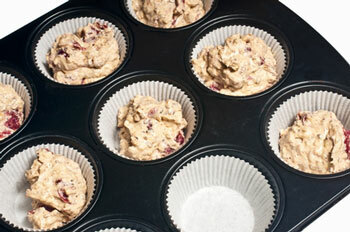 To bake your muffins either grease a 12 hole muffin tin or you can use paper cases. Simply place the paper cases into the muffin holes. Muffins are usually baked in a moderately hot (375ºF / 190°C) oven. Using paper cases makes them easy to remove. Spoon the mixture into the muffin holes or paper cases but only fill them about two-thirds full. To make them even sizes, try to put the same amount of batter into each hole. Bake until the tops are firm and golden brown. To prevent soggy bottoms, remove immediately from the tins and allow to cool on wire racks. Muffins can be made in any size from mini, regular or jumbo size. 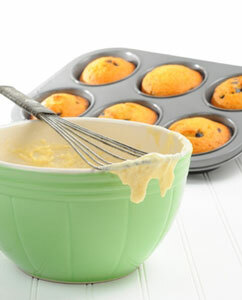 Any muffin mixture can be cooked in any sized pan, simply adjust the cooking times. They are cooked when they spring back when lightly touched. Muffins are best eaten on the day of baking. However they do freeze really well and can be quickly thawed and freshened in the microwave. Six regular sized muffins will take 2 – 3 minutes to thaw from frozen in the microwave. They can also be re-heated in the oven. Thaw first then simply wrap each one in foil and place in a pre-heated oven. Or place on a plate and zap in the microwave (without the foil of course). Once you learn the finer points of how to make muffins, you can create just about any flavored muffin you like. Use whatever ingredients you have on hand, such as fresh, frozen or dried fruit, nuts, sweets, spices, jams or essences.